SWAE Watches releases The Hawaiian Watch on Kickstarter. Made out of Hawaiian Koa Wood, this watch is created with the full spirit of Aloha and helps reforest Koa Trees back to the Kingdom of Hawaii. Jan. 6, 2014 - SAN DIEGO -- Tomorrow, SWAE Watches will officially launch "The Hawaiian" on Kickstarter (www.kickstarter.com). 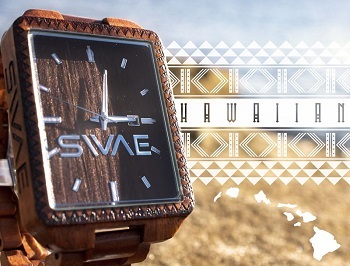 Grown on the northeast slopes of Mauna Kea and handmade from fallen trees free of any toxic chemicals, SWAE (http://www.swaewatches.com/) is pleased to introduce THE HAWAIIAN. 100% original in design, we created this watch with some of the island culture within it. This extremely light weight watch is made from Hawaiian Koa Wood, a prized wood that symbolized strength and bravery within the Hawaiian Islands. Our wood was grown on the Big Island of Hawaii and features traditional Hawaiian details such as the Niho inspired tribal border that surrounds the watch. This triangular Hawaiian image takes on the appearance of shark teeth which is also a symbol of power in the islands and power we are now putting on your wrists. We’ve spent an entire year creating this watch and spared no expense to make it exactly the way we envisioned, not once did we take NO for an answer on the detail we wanted to include such as the Niho inspired border. From choosing the high grade Koa down to it’s unique detail on the case and bezel, we made sure that this wooden watch would be far different from all the rest in the market. Since Koa is one of the most valued exotic hardwoods in the world and quality meant everything, for the movement of this watch, we’ve decided to use a quality Swiss movement as well as using a scratch proof crystal sapphire as it’s window. Cool right? Well it GETS BETTER! We are the FIRST & ONLY company in our industry to use this tropical hardwood used by Hawaiian Chiefs and Monarchs for watches while others commonly use sandalwood, maple, bamboo, and blackwood making us original. Due to Koa's different shades, every watch will not be the same, in fact, every single one of them will have it's own unique look and detail to it. Not only that, we are firm believers of "IF YOU TAKE FROM THE LAND, GIVE BACK TO THE LAND!" In Hawaiian, we sayMALAMA KA 'AINA (respecting the land), with that being said, when you purchase this watch, you will help us REFOREST HAWAII’S NATIVE TREE back to the land. Koa Trees are in great danger due to DEFORESTATION, and because of it, the deforestation of this tree is affecting Hawaii's natural habitat and endangering animals near extinction who depend on Koa for its survival. The problem occurred when land was cleared due to cattle grazing, homes being built, pineapple fields, sugar cane, etc... WE ARE NOT CUTTING DOWN A SINGLE KOA TREE TO MAKE THIS WATCH! With the purchase of this watch, a koa tree will be planted and you will receive a certificate with GPS COORDINATES as to where the tree is planted which will be in Umikoa, Hawaii (northeast side of Mauna Kea), land that was once owned by KING KAMEHAMEHA THE GREAT and was his personal Koa forest during his reign. With each tree planted, a scannable electronic chip is placed in the ground. The chip contains a serial number for the tree and is linked with the GPS coordinates of its location and will give you visuals of growth of the tree. You also get to dedicate that tree to a loved one or in memory of someone and have access to the grounds to visit your tree at any time. With your help and purchase of THE HAWAIIAN, the survival of the trees are GUARANTEED for growth for future generations to enjoy. In order to make this project a huge success, not only do we need your help to produce the initial fulfillment, but we also need your help to market this in various media outlets as well. Go to www.kickstarter.com, type in key word "The Hawaiian" and help support SWAE Watches and the State of Hawaii. PURCHASE THE WATCH, PLANT A TREE, REVITALIZE OUR PLANET, THAT SIMPLE!